With the dull side of a chefs knife smash the lemon grass to bruise and release its oils. Finely mince the garlic, cut the lemon grass into 2 or 3 pieces. In a large soup pot, combine the flaxseed cooking oil, the minced garlic, the cut and bruised lemongrass, the slices of ginger and the red curry paste. On medium heat, heat the ingredients to release their flavors, about 5-10 minutes stirring occasionally to prevent sticking and burning. While the aromatics are heating, small dice the onions, carrots and celery. Add the diced vegetables to the pot and saute for 5 minutes, then add the palm sugar, the fish sauce and the rice vinegar. Continue to cook the ingredients on medium heat to reduce the wine and vinegar, about 5 minutes. Add the chicken thighs, chicken stock and water, increase the heat to high and bring to a boil. Add the lentils, reduce the heat to a simmer and allow the soup to simmer gently for about an hour. After an hour, the lentils, vegetables and chicken thighs should be soft and well cooked. Turn off the heat source and remove the chicken thighs, the ginger and lemongrass. Discard the ginger and lemongrass and allow the chicken thighs to cool enough to remove the bone and shred or chop up the meat. 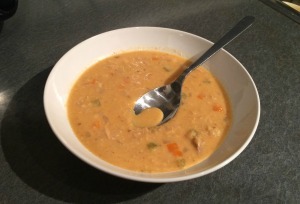 Add the chopped or shredded chicken meat back to the soup and stir in the can of coconut milk as well. Taste the soup and adjust the seasoning with some salt if needed. The soup may be garnished with thinly sliced scallions, chopped cilantro, thai basil or mint.